Milk Bottle Grocery in Oklahoma City is the type of historic Route 66 establishment that you can miss only if your eyes are closed. Constructed in 1930, the tiny, 350-square foot triangular commercial building of red brick is located on a speck of real estate smack in the right-of-way of a busy urban thoroughfare. It sits at an old streetcar stop along a line that ran diagonally across Classen Boulevard, which served as a segment of Route 66’s original Oklahoma City alignment. Subsequent realignments of the highway, first along Western Avenue and then on 23rd Street, remained only a stone’s throw from the site. If conducting business in a tiny brick store in the middle of a city street is not remarkable enough, the towering milk bottle perched on the store’s flat roof confirms that the Milk Bottle Grocery is a Mother Road must see. Built of sheet metal around 1948, the eye catching milk bottle was, and still is, a funky advertising gimmick for the dairy industry. The building’s tight spatial restrictions--hemmed in on all sides by roadway--no doubt determined the milk bottle’s rooftop locale. With only inches to spare beyond its walls, the only place left to go was up. The supersized milk bottle is representative of the mimetic tradition in commercial architecture, which seeks to mimic a commonplace object--often to grotesque proportions--to draw attention to a business or product. Yet, the milk bottle never directly connected to the business of its place. It has always been rented separately. Over the years, lettering and logos on this classic icon have been painted and repainted to accommodate a long line of milk related promotions. For those too young to remember what a real milk bottle actually looks like, this rendition is remarkably true to form, from its long, tapered neck up to its rimmed mouth and its clever, metal crenellated version of the traditional, folded paper bottle cap. 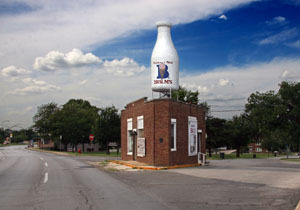 Aside from the big bottle, what is most memorable about the Milk Bottle Grocery is the primacy of its location for doing business in the automobile age. Over the decades, this modest but well-situated building has continued to draw a wide range of commercial ventures, including a cleaners, a realty office, the Classen Fruit Market, a barbecue “shak,” and the Triangle Grocery, and a Vietnamese sandwich shop. The Milk Bottle Grocery was listed in the National Register of Historic Places in 1998. The Milk Bottle Grocery is located at 2426 North Classen Blvd in northwestern Oklahoma City, OK. The National Register nomination form can be found here.